One of India’s best kept secrets, these traditional Shakti village houses in rural Ladakh are made from sun baked mud bricks with décor set to rival the most welcoming of homes. Look out over the high altitude desert, rugged snow-capped mountains and turquoise lakes, in a part of the world that is entirely unspoilt and unexplored. In the northern region of India and 3,500 meters up on a high plateau, affectionately known as ‘Little Tibet’, hides Ladakh. The Shakti village houses sit by the untouched villages of the Indus Valley where the Indus and Zanskar rivers are fed by glaciers and intertwine through the lush valleys. 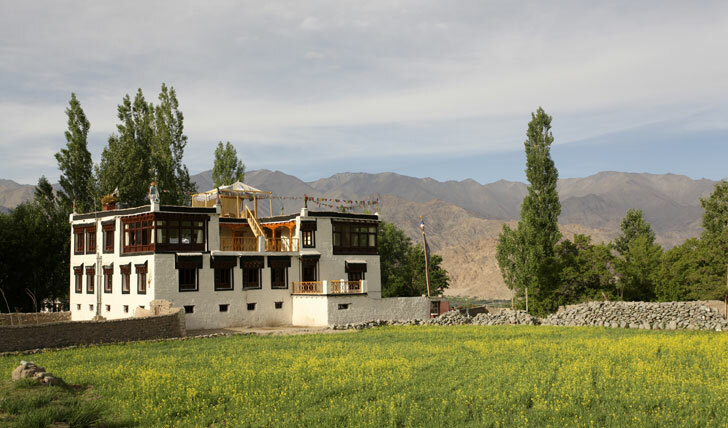 This charming guesthouse is a one hour drive from Leh domestic airport, which connects Ladakh to Delhi. Feel free to wander through the streets of Nimoo and visit the monasteries, discovering rural Ladakhi life and the ways of Buddhism. Relax in the courtyard or up on the roof terrace and soak up some sun before enjoying an evening meal of north Indian cuisine. An historic village, Shey is a 20 minute drive from Leh. Resting serenely on the banks of the Indus River, Shakti Shey Village House is surrounded by snow-capped mountains and overlooks deep turquoise lakes making it a perfectly tranquil hideaway up in the Himalayan Mountains of Northern India. Spend your days exploring the local monasteries and markets or trek into the surrounding mountains and raft down the River Indus. The ‘Lompo’ house is one of the most remote Shakti village houses, far from the commercialisation of Ladakh. The village of Igoo is known for its slow pace of life and secluded and peaceful environment, making it a popular destination for monks to meditate. Spend your days exploring the nearby monasteries and marvelling at the epic mountain views. Named after the river which divides the two villages of Ranbirpur and Stakna, Shakti River House lies in Ranbirpur, just one hour’s drive from Leh. The house is surrounded by the Stok Kangri mountain range and has impressive views of three nearby monasteries. 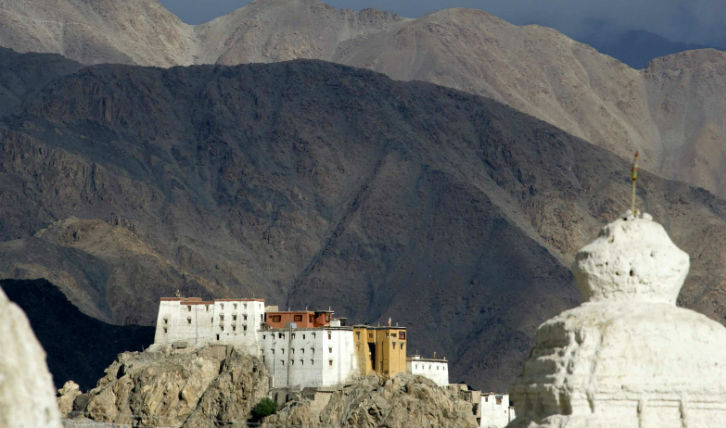 Explore both banks of this picturesque area and immerse yourself in Ladakhi culture. The beauty of these small village houses is that each one is different and remains traditional with a hint of luxury but without compromising on its authenticity. Each has a cozy living room and sun terrace where you can sit out and admire the view. So step onto the traditional ‘chettai’ matt floor and into your Indian home-from-home. The house is spacious with just one-storey built around a courtyard. With three lovely, bright rooms, you’ll find complete serenity surrounded by green fields and apricot, apple and walnut orchards. Each room is decorated to maintain traditional features with Tibetan carpets giving an added touch of comfort and authenticity. At over 100 years old, this guesthouse has been fantastically renovated to fulfil your comfort needs while maintaining traditional features. Soft furnishings adorn the three rooms in gentle shades and large windows ensure a breezy feel. The roof terrace is a great place to lie back with a book and enjoy the views of nearby Shey Palace, Thiksey Monastery and the mountains. This hugely respected Shakti is over 300 years old and once belonged to a very elite family in the village. It used to have a huge prayer room which a monk would look after and conduct ceremonies from, but this has now been converted into an elegant bedroom featuring ancient artefacts. The three ensuite bedrooms at the Lompo House all offer great views over the village. The four ensuite bedrooms of Shakti River House are some of the most luxurious of the Ladakhi Shakti village houses and offer stunning views of the surrounding area. Restored from near ruin, the River House maintains the rustic style of other Shakti village houses but with a sophisticated edge, featuring beautiful furnishings and Buddhist iconography. We love the traditional and homely feel of the Shakti village houses, providing a truly authentic Himalayan experience and avoiding the commercialisation of the larger towns. You’re taken off the beaten track, where few tourists will venture, to a location not to be missed with its striking scenery and fascinating cultural heritage. You’ll soon feel the rejuvenating effects of the surroundings as you visit local monasteries and markets, providing you with the perfect antidote to the hectic world you have left so far behind you.